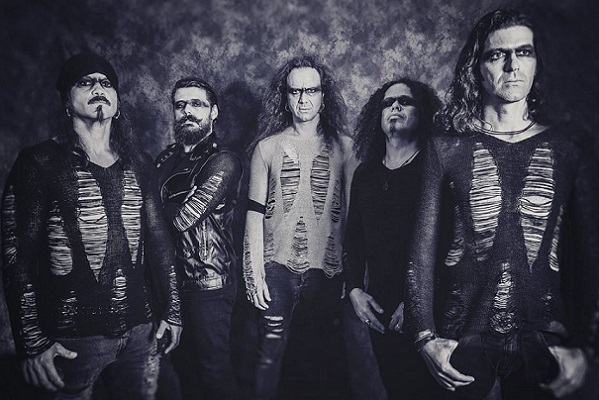 Home » » Interview - MOONSPELL - I believe the enthusiasm for the stories we tell plays an important part. Interview - MOONSPELL - I believe the enthusiasm for the stories we tell plays an important part. 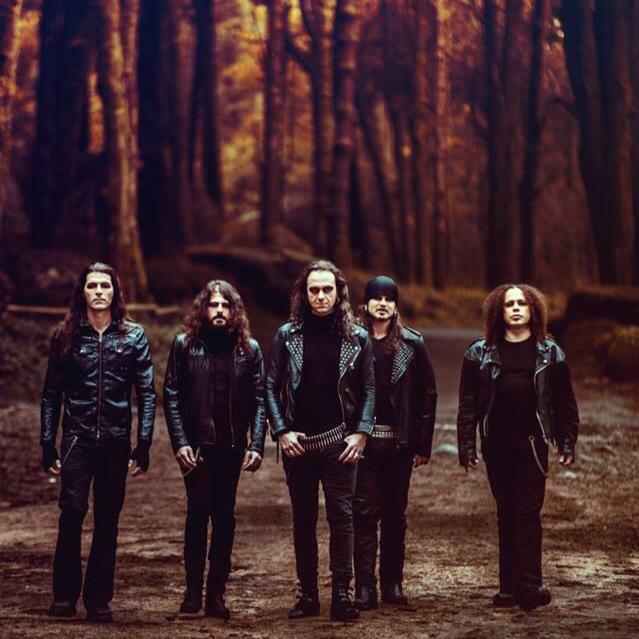 Interview with dark metal band from Portugal - MOONSPELL. Ave MOONSPELL, I started listening to your music since the demo record “Anno Satanae” and I have to say that the new album “1755” was getting to me a little longer than the other albums. The album has many locations, various dark corners which the listener will discover after a while. Did you have a different approach to the composing than in the past? How did you compose the new album? Moonspell loves to write new stuff and throughout the years we have developed a creative process to involve all the band, 1755 was not different. It all started on pen and paper, ideas, loose vocals tracks and riffs and bit by bit we went and introduced the elements needed to tell this story. we worked on it for one and a half year and had two recording sessions with tue madsen and a very long pre production with our orchestrator Jon Phipps wh had a major role on the final outcome i must say. The topic of “1755” is the earthquake in Lisbon. I know from available sources that it was one of the biggest earthquakes ever. 60 000 people died, the city was hit by the tsunami and then fires. This is definitely an interesting topic which suits to your dark music. What was your source of inspiration? I know that it was the first catastrophe which was investigated by philosophers and they set the basis of seismology. Have you read any books? If so, tell us about them. The 1st of November of 1755 was the very day that the destruction of Lisbon allowed Portugal to catch up with Europe, in terms of a more fair society and a less oppressing religion. This day was like if Portugal was grabbed violently by the quake, fires and tsunamis and thrown out of the Middle Ages and placed finally on the late 18th century. Rough but fascinating. We all learn this history of death and rebirth on the classrooms of the country and for me it always struck me as a great concept. I confessed I waited for a few years but it seems that now, especially in a Portugal that was punished by violent fires and bad political decisions, everything around us brought this album together. The earthquake is ultra symbolic but the true story is nothing but Lisbon falling down and rising from the ashes through hope, effort, true faith that was once in the Portuguese hearts. Many writers wrote about this event. Kant pursued his interest in seismology. Many priest, educated tow rite, sent their accounts to the Pope yet no author was more important for me than Voltaire and his Poem about the Disaster of Lisbon. The lyrics are in Portuguese this time. I have to say that I do not understand your language at all but this choice made the album completely level up. It sounds interesting and I feel that although I do not know the lyrics I know what you sing about. Still, could you please tell us briefly what each song is about? What I really like about MOONSPELL is that each album is different. One is harder, other is darker or nobler. Still, you are very recognizable after a few tones. Sometimes I feel like you know some magic spell or recipe which makes your music interesting. Please, can you tell us how do MOONSPELL compose new songs? I believe the enthusiasm for the stories we tell plays an important part. When you have the words, you can paint them with music and make the music closer to what the texts have to say. Thus the changes and the experiments but also the happy fact that, regardless of trend or public appreciation, we never left any stone unturned and did what we like and needed to present ou vision, whatever that might be. The first thing that hit me while listening was the great orchestration. The new album has great beginnings, you play with moods, once you are dark, then sharp and cold. The sound is nicely treated. Tue Madsen was the producer. I would like to know if you were able to have any comments in case of the final sound. Who had the last word about how the album sounds? It’s more of a team work than what people think but final word is ours, the bands, of course. We can not neglect our experience and taste in the final result of our music. On the other hand we don’t hire a producer or an orchestrator like ordering pizza. A bit more cheese, a bit more olives, no, the human factor is really important, music is always a process of seeing the bigger picture and Tue helps us to see that while delivering a crushing sound just like the album needed. In the song “In Tremor Dei” there is a woman voice which sings “gipsy” motive. Personally I think that that is the best moment of the whole album. I cannot find anywhere who sings it. By the way, the cartoon music video is also great! It’s not a woman’s voice. It’s a male Fado (Portuguese traditional music) and his name is Paulo Bragança. He is indeed a very different singer, and has a lot of Portugal tradition inside him that inspires him to sing like that. I love his work and he brought a really cool dimension to that song, something from the streets yes. Fernando, I know that you studied Philosophy at the University of Lisbon. You published 2 books of poetry and one about short stories. Were all of your books published in Portuguese only? What are your books about? Have you ever thought about translating in into English? Not anymore. You can find my poetry compiled in an anthology named Purgatorial available from our webstore (alma mater books/rastiho.pt). I did translate those myself in order to keep the original spirit but it turned to be a different book, like a new one. My books are poetry so they are really about everything from death of love to cats hanging out the living room. I once read in an interview with you and you know Franz Kafka. I really like the story in the book Transformation (Proměna in Czech) and also his difficult book The Castle. Fernando I am thinking about a very bold idea…do not you want to be inspired by his work in your next album? What literature do you like and who are your favourite authors? Kafka is super and his work influenced me on Sin, where I was really into dystopias and alternative realities that are in fact our daily routines. I read a lot of his books, one of my favorites are America, the Process, etc. I always read a lot about the subject i am working on and now I am reading a lot of essays and stories about hermits and overpopulation, two contradictory subjects that I am maybe going to explore with a new album. You play a lot of concerts. Your performances are the best what people can see on the metal stages. I remember you as a black band when you were at your beginnings. Back then I saw you a few times but the best experience from your concert was when you were here in Pilsen. The Czech band ROOT played before you and you sang a duet with Big Boss. It was in 2005 and for my wife it was your first concert. Since then she loves you. She wants me to tell you that she is very thankful for everything! How do you feel about Czech fans? Do you know any Czech bands? I absolutely love the Czech scene, I know more of the old bands than the new ones, it’s a fact with Root on top. As Root is, unfortunately, not a household name on the scene and even many musicians don’t take them “seriously” I believe them to be one of the best bans I ever listened to and a bit influence on Moonspell’s music. 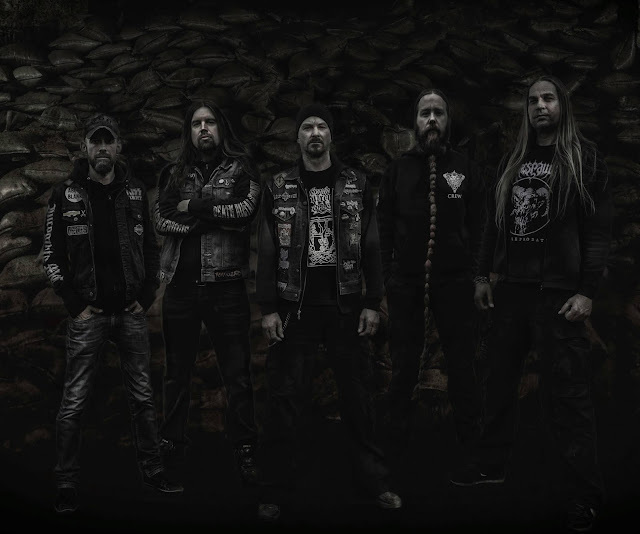 Also they are on my top 5 favourite band ever together with Bathory, Celtic Frost, etc. I did a song on the album Black Seal, called Salamandra and play live with them in Pilzen one. 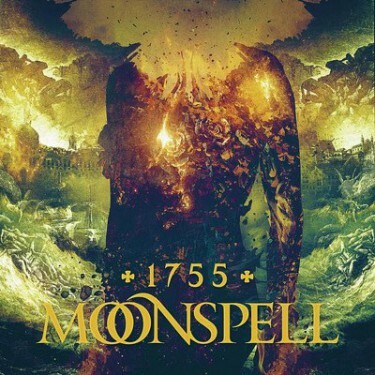 Czech fans are fantastic for Moonspell and they really loved this new album 1755. I know many Czech bands: Root, Master’s Hammer, Torr, etc, they are amazing! The cover for your new album was done by Joao Diogo. I have to say that this was the first time I saw his work. How did you managed to work together, where did you meet and why did you chose this motive? The figure on the cover is supposed to represent a man who survived the earthquake? I wanted to work with JD for quite a while as I loved his work and versatility. Also, I wanted a Portuguese designer to make this one as this story is closer and more known to a Portuguese citizen than any other nationality. He really did a terrific job. we have two covers (CD and LP) and they tell the same story of a fallen Lisbon, Lisbon is the main figure so to speak. MOONSPELL started in 1992. There is a big journey from the small Portuguese band. Nowadays, you play on big stages and you have a famous label. We can say that thanks to hard work and talent your band is successful. Do you still have any dreams, goals or bases you want to achieve? Indeed it is and quite unexpected. Our goal now is much more to write quality and original, changeling stories and songs than really to visit this country or city, or play that festival. We have to understand that e have entered our final years in a way and as far as Moonspell goes, the opportunity to still release albums and tour is what makes the difference. Those are our goals. On the January 18th 2018 you are going to start your big tour with CRADLE OF FILTH in Prague. I cannot wait. The last time I saw you was in 2015 in Pilsen where you played on Metalfest. Great performance. I was just disappointed that you played while there was still the Sun outside. I think that darkness and night would suit much better to your music. What do you have prepared for Prague? Make the excitement in fans grow! I think that you have known CRADLE OF FILTH for a long time. You have already played many concerts together. I read somewhere that you are friends. Do you have any interesting and favourite stories from your tours? Please, share them with us! Hahah. Many and some from this new tour. Cradle always played tricks on us in the past, skeleton dancing, flour in our heads during fullmoon madness, Dani’s favorite song, so i went on stage with them in Stockholm, Sweden, fully dressed as a doctor plague and rocked out with them during an entire song! Thank you so much for the interview and for the music you do. You are one of my favourite bands and I cannot wait to see you in Prague! I wish you tons of great ideas and I also wish you luck in your personal life!